Gaia Lodge in Hulme End, near Ashbourne sleeps 2 people. 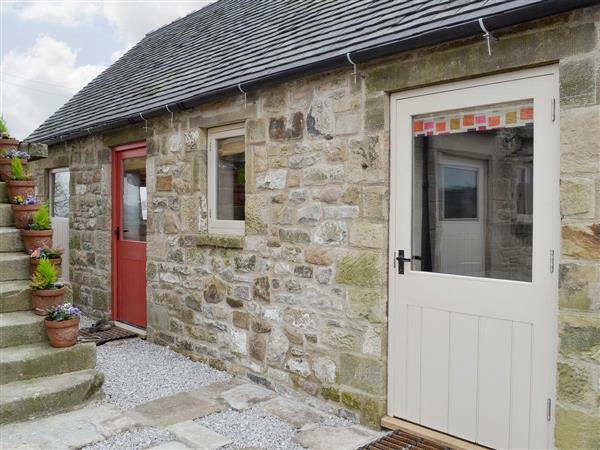 Gaia Lodge near Ashbourne is a barn conversion which can be found on the family run camping site of Upper Hurst Farm, adjacent to the owner’s home, in a rural idyll surrounded by the beautiful scenery of the Peak District National Park. The cottage itself has exposed beams and stone flag flooring, in true keeping with the design. It is enhanced further by full underfloor heating, a wood burner and its own private hot tub, to provide a truly special stay. Upper Hurst Farm has a nature-based, ethos encouraging biodiversity in fields and hedgerows. In addition, the majority of energy is provided from sustainable sources or solar panels. Resident animals include a pair of alpacas, a free range peacock and peahen, four characterful and friendly mini Shetland ponies and free range chickens, in turn, making eggs available to buy. There are resident little owls as well as other indigenous owls and buzzards, and peregrine falcons are a common sight. An area popular with walkers, cyclists and nature-lovers alike, the River Dove is just 1 mile away and takes you to Hartington, Dove Dale and Biggin, via Biggin Dale. It is also just 1 mile to the River Manifold and the start of the Manifold Trail. The Tissington Trail is around 3 miles away, and a dog friendly, food serving pub is within walking distance of the cottage, as is the local village stores. The picture postcard village of Hartington is just 2 miles down the road and the market towns of Buxton, Ashbourne and Leek are all around 20 minutes from the site, providing a wide range of shopping and leisure facilities. Bakewell, Chatsworth Estate and Haddon Hall can all be reached in around 30 minutes, as can one of the country’s most popular theme park, Alton Towers. The shop, pub and restaurant are ¾ mile from Gaia Lodge near Ashbourne. Ground Floor: Gaia Lodge near Ashbourne is all on the ground floor. Open plan living space: With stone flag floor. Living area: With wood burner, Freeview TV, DVD player and Bluetooth speaker. Kitchen area: With electric oven, induction hob, microwave, fridge and dishwasher. Bio mass underfloor central heating, electricity, bed linen, towels and Wi-Fi included. Initial logs for wood burner included. Travel cot and highchair available on request. External utility room with freezer, washing machine and tumble dryer (shared with other properties on site).Small lawned garden with patio, garden furniture, barbeque and fire pit. 4½ acre natural unspoilt grounds (shared with other properties on site). Hot tub for 4 (private). Bike store. Private parking for 1 car. No smoking. Holidays at Gaia Lodge run from Wednesday to Wednesday. Pets allowed at Gaia Lodge. For a better idea of where Gaia Lodge is, you can see Gaia Lodge on the map below. Gaia Lodge is in Staffordshire; should you be on the lookout for a special offer, you can find all the special offers in Staffordshire. It's always worth checking to see what is on offer at the moment. Do you want to holiday near Gaia Lodge (UK4047), you can see other cottages within 25 miles of Gaia Lodge; have a look to find your perfect holiday location.